The lot includes necklaces, pendants, bracelets, pin/brooches, and one adjustable ring. This lot has a lot of rhinestones. I will try to combine when possible. Great lot for crafting or re-purposing. 4 pink rhinestone butterfly beads. 4 blue rhinestone butterfly beads. Faux pearl strand, faux pearl clip on earring singles. Ornate amber seed beads. 5 butterfly pendants. 94 ivory colored celluloid beads. There are several carved stone scarabs.the cobalt blue is glass. There are 2 plaques that are porcelain - 1 with angels and the other with flowers. There are lucite pieces - 2 matching round with gold roses (probably used to be earrings) and 2 that are heart shaped with holes at the top. I do my best to make sure the item you receive is exactly or better than you are expecting. 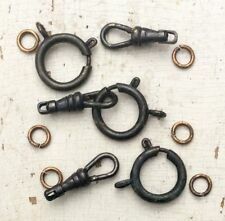 Authenticvintage lot to dangle, jangle, mangle and untangle. Some good and wearable, some with slight issues, some singles, some needing TLC, huge variety of jewelry, plus jewelry pieces. Everything shown. Please view all photos. 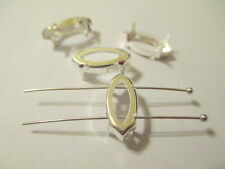 This is a nice group of sterling silver estate jewelry for restoring, repair, parts or scrap. The wide rhinestone bracelet is marked Sterling and is missing two stones. There are also a few stones that have darkened so to brighten it up you might want to replace them too. Amber colored stones, AB rhinestones, pail Yellow Flowers. The center stone on the brooch needs to be replaced the earrings are all good. Ten watches None of the watches are working. Used for crafts. PIECES: 290. I HAVE OTHER HUGE MIX RHINESTONE LOTS AVAILABLE. TYPE: pointed back rhinestone gold foiled and un foiled. COLOR: Huge mix of colors. jewelry Crafts Repair etc. great for jewelry design on bracelets necklaces earrings brooches. Large pink stones, 2 separations, claw clasp. They are 10k RGP ~ 1/20 12K GF ~ stainless steel ~ 10K rolled eletroplated. They range from good ~ TO ~ near mint condition. This is a antique sterling silver ring setting with no stone. The setting has 4 prongs to hold a stone. The stone size would be about 7mm across. It is marked "Sterling" with a maker mark that looks like a "W" inside a triangle. Lot Vintage Brooches Enamel Flowers Rhinestones Cluster Glass Beads Rhinestones for Craft Harvest Repair White, cream gold colors. 26 pieces. Very good quality pieces with some signed brooches. Lots of pretty enamel flowers too. Fabulous lot of white, cream with gold Brooches and one pair of earrings. There may be some other bits and baubles. Some pieces have the backs or clip finding removed. This is a craft lot. Lots of gorgeous pieces! 26 pieces in this lot. Shipped with USPS Priority Mail Small Flat Rate Box. Lot Vintage Single Earrings and Brooches Cluster Glass Beads Rhinestones for Craft Harvest Rep. Silver metal colors. 170 pieces. Very nice quality with lots of signed pieces. Vintage jewels from 1940s to 1990s. It would take you days and weeks to find this much and this quality of vintage jewelry. My buy now price is very affordable at $180 which makes the cost about $1 a piece. What a bargain! Fabulous lot of silver colors, brooches and single earrings. There may be some pairs and other bits and baubles. Some pieces have the backs or clip finding removed. This is a craft lot. Lots of gorgeous pieces! 170 pieces in this lot. Shipped with USPS Priority Mail Medium Flat Rate Box. This jewelry lot is for Arts/crafts. Vintage Beads And Rhinestones For Crafts & Repair Lot. Shipped with USPS First Class Package. VTG Dior Clear Round & Blue Princess Cut Crystal Clip Earrings Quick Fix Must C! This is a craft lot. Lots of gorgeous pieces! 180 pieces in this lot. Very nice quality with lots of rhinestones, glass beads, Lucite and faux colored pearls. Ww1 Shrapnel Guard Reproduction . If you have any questions feel free to ask. No international shipping. This can happen during travel or even minor wear. Weight: 4g (total). Beaded necklaces and bracelets are sold in good wearable condition, unless otherwise noted. However, they even those in great condition can break unexpectedly. Elgin Sportsman - 17 jewel manual wind / circa 1950 - "excellent"
Welcome! I have 6 Translucent Rectangle Glass Intaglio Reverse Camphor Glass Cabs with Swan design Lovely! Great Vintage quality Size:17mm x 12mm All of my vintage glass items imported by a gentlemen that traveled throughout Europe in the 80's buying out old glass jewelry factories, remnants of family-run businesses. He would purchases everything from them. He spoke about crawling through dirty basements and climbing up in dusty attics to find wonderful treasures. He exported many many items from Kaufbeuren. He retired about 20 years ago, I bought the remainder of this stock and it has just been sitting storage! His finds have now become your finds! I am excited to bring you new treasures every week. TYPE: pointed back & Flat Back rhinestone gold foiled and un foiled. SHAPE: Oval. HUGE MIX 250 ALL GLASS OVALS NEVER USED Pointed back & Flat back gold foil back and unfoiled. jewelry Crafts Repair etc. HUGE Mix Old Vtg Mini small Flower & Leaf Jewelry Design Craft. great for jewelry design on bracelets necklaces earrings designing a brooch. TYPE: Hard and soft plastic. SHAPE: flowers. SIZE: mixed sizes these are small flowers. Lot Vintage Single Earrings Cluster Glass Beads Rhinestones for Craft Harvest Repair Faux pearl colors. 155 pieces. Very nice quality with lots of rhinestones, glass beads, Lucite and faux pearls. Vintage jewels from 1940s to 1990s. It would take you days and weeks to find this much and this quality of vintage jewelry. My buy now price is very affordable at $165 which makes the cost about $1 a piece. What a bargain! Fabulous lot of faux pearls, mostly single earrings. There may be some pairs, an occasional brooch and other bits and baubles. Some pieces have the backs or clip finding removed. This is a craft lot. Lots of gorgeous pieces! 155 pieces in this lot. Shipped with USPS Priority Mail Medium Flat Rate Box. This auction is for the all the 12 crafting jewelry in the picture. Size is in the picture. Please see all the pictures for the Nice condition. Questions are welcome. From a smoke free home. I do COMBINE SHIPPING. Ask for a combined invoice when you check out before you pay. Please check out my ebay Store and other Auctions for more Beautiful Jewelry. All My Jewelry is well packed and shipped in a new box. Check back often as I list new items every day! Thanks for looking have a great day. CROWN TRIFARI. SINGLE EARRING. 3 GOLD TONE. WEST GERMANY. ALL SIGNED. LIKE ONE PEARL. PEACE TO ALL. """"""""""`. ~ ART DECO ~CLASP & CONNECTOR ~3 HOOKS ~Single HOOK. ~ Be Observant within Your Community and Protect Our 'Children and Animals' from Abuse ~Make the 'Anonymous Call'! 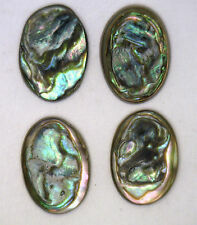 They are old cut cabochon Opal Stones. I am human and do make an occasional mistake and I would like the chance to correct it. They would make great earrings or a pendant or be pretty on a ring. Darker areas. lost in golden. OTHER MINOR DEFECTS HERE & THERE DUE TO AGE. and added to the group. We will hold them no longer. found them. than two weeks. As we have attempted. The size will be in the title or in the picture. Single earrings. Large lot of assorted pierced earrings. some vintage.